Methods for transportation have played a part in the human experience for centuries, from horse and buggy, to cars, to airplanes, to the future of endless possibilities. Motor vehicles took center stage when Henry Ford rolled out the four-horsepower Quadricycle prototype in 1896. It was the beginning of newfound freedom for travelers to relinquish the reigns of horse and buggy and for artists to explore groundbreaking design merged with ever-changing technology. From Henry Ford to Giorgetto Giugiaro to Elon Musk, designers continue to meticulously experiment with aerodynamics, shape, proportion, accessories, and comfort. As consumers see the automobile as a vehicle for freedom, control, and luxury, artists see it as a canvas or sculptural form for contemporary expression. Husband and wife team Cameron and Rachael Van Dyke have surfaced as artists who push the boundaries of transportation, housing, and consumption. Like Henry Ford, their projects question social norms and systems leading to ingenious design with simple, available materials. Their projects explore "what it means to be citizens of a specific place and time, and seek the freedom to uncover sustainable systems." Their "Future Cycles" project incorporates the art of design and technology with innovative vehicles, short films, and public displays to spark imagination beyond standard conventions that reduce the carbon footprint. 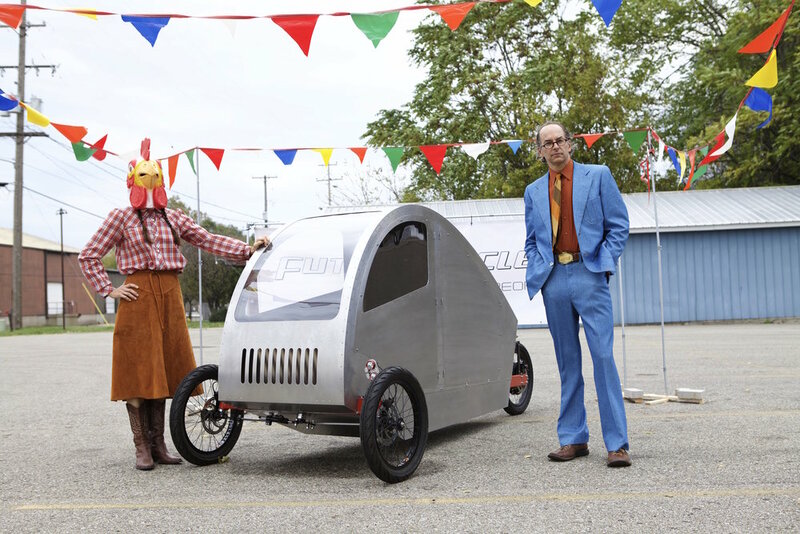 Van Dyke's hybrid electric-human-powered cars combine the efficiency of a bicycle with the protection and load capacity of a car under a sleek, futuristic design. Bike and car coexist in a shell of bolted strips of aluminum and polycarbonate. The Future People: Creating Public Imagination will include three Future Cycles and accompanying drawings, photographs, and writings that "fuel" their installations. One of these Future Cycles will have its premier unveiling at The Delaware Contemporary. The Future People: Creating Public Imagination will also include the Van Dyke's "Turtle Island" project, a nine-month living off-the-grid experiment in a small rustic cabin on a 1000-acre wildlife preserve in the Blue Ridge Mountains of North Carolina. They carried all of their belongings, food, and water a 1/4 mile to the cabin. Without electricity or running water, what they call "thedistractions of modern conveniences," they designed their living quarters to maximize efficiency yet with aesthetics in mind. They learned to care for animals, while at the same time developed a deeper connection with nature. Through this project, they hope to share their "experiences with others that [seek]...a more authentic and meaningful relationship with the natural systems that support life." Cameron and Rachael Van Dyke understand the importance of beauty and necessity in daily life, and found a way to express and live with aesthetics in modest, efficient models. This exhibition prompts viewers to consider possibilities of living and mobility as a vehicle for dialogue on alternative values and priorities such as speed vs. energy reduction. Cameron Van Dyke received his BFA from the School of American Craftsman in Furniture Design and Fabrication at Rochester Institute of Technology, Rochester, NY, and his MFA at the Stamps School of Art and Design in 3D Design, Socially Engaged Design, and Design Thinking Methodology at the University of Michigan, Ann Arbor, MI. He owns an independent design and fabrication studio in Grand Rapids, MI. His work has been exhibited and distributed nationally with commissions and public objects in cities around theUnited States. He co-curated an experimental home/public live-in studio space, Capsule Gallery, where he exhibited the artwork of regional and national artists, and his own furniture work as a redefinition of home. Van Dyke currently serves on the faculty at Appalachian State University. His work has been in solo and group exhibitions, notably, Spencer CDC Museum, Atlanta, GA, Miami Dade College Museum, FL, Cooper Hewitt, NY, Art Chicago Aureus Contemporary, IL, International Contemporary Furniture Fair, NY. His public commissions include steel sculpture in Denver, CO, concrete seating pods in San Jose, CA, public seating in East Hampton, MA, large scale steel sculpture in Jenison, MI, Grand Rapids, MI, large scale fiberglass sculpture in San Diego, CA, concrete seating pods in Coral Springs, FL. His work is in the collection of the Cooper Hewitt Smithsonian Design Museum, NY and the New Britain Museum of American Art, CT, and in numerous publications. Future Cycles was featured at the North American International Auto show 2015 and in Design Boom, Fast Company, and Dezeen Magazines. Rachael Van Dyke is a mid-career artist represented by LaFontsee Galleries, MI, Synchronicity Gallery, MI, BRAHM, NC, and River Centre Gallery, OH. She is an avid artist in resident traveler most recently in the historic town of Tusa, Sicily and on the remote island of Isle Royale in Lake Superior with the United States National Park Service. Van Dyke's residencies have also included Studio Ginestrelle, Assisi, Italy, Le Jardin Botanique, in Marnay sur Seine, France, TICA with the Art Institute of Chicago, and Les Tasis located in the Ardeche Valley of Southern France. She is also a Fulbright Memorial Fund teacher recipient to Japan. Van Dyke has had solo art exhibitions with the Forest Hills Fine Art Center, the Power Center of Performing Arts in Ann Arbor, MI and the University of Michigan Hospital Gifts for Art program. She earned her MAE at the Kendall College of Art and Design and has worked as an art and design educator for all grade levels including adjunct instructor at the College for Creative Studies in Detroit, MI. Rachael Van Dyke has participated in numerous public presentations and adult workshops including talks on art and creativity, art and the spiritual, and on how space and place influence a body of work. Van Dyke also engages in social activism through art-making.